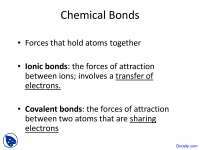 • Ionic bonds: the forces of attraction between ions; involves a transfer of electrons. • An ionic bond is the attraction between a positive ion and negative ion. • The ions are arranged in a pattern called a crystal lattice. • Covalent bonding between unlike atoms results in unequal sharing of the electrons. • The difference in electronegativity between two atom in a bond is a measure of bond polarity. A larger difference in electro- negativity means a more polar bond. Choose the bond in each pair that will be more polar. • Any molecule that has a center of positive charge and a center of negative charge at different points in space is said to have a dipole moment. 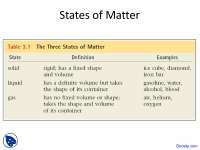 moment depends upon the atoms involved and the three-dimensional structure. molecules, and therefore the physical properties of the substance. For example, water readily dissolves NaCl. 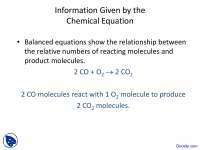 What are the electron configurations of the ions in the following compounds? • Formulas are predicted by achieving electrical neutrality using the component cations and anions. 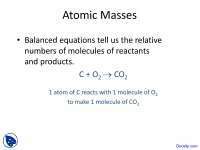 What is the formula of the ionic compound formed from Al and S? 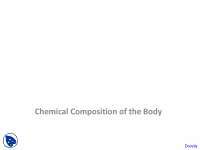 • In polyatomic ions, the atoms in the ion are connected with covalent bonds. The ions are attracted to oppositely charged ions to form an ionic compound. • All are solids at room temperature. – Melting points are greater than 300°C. the solution becomes an electrical conductor. • Crystal lattice: geometric pattern determined by the size and charge of the ions. packed as efficiently as possible, with the cations occupying the “holes” in the packing. 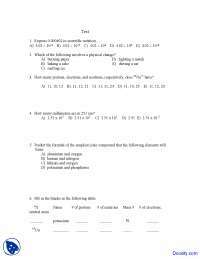 • Use the symbol of the element to represent the nucleus and inner electrons. • Use dots around the symbol to represent valence electrons. • Hydrogen shares two electrons (duet rule). • Helium already has two, so it does not form bonds. 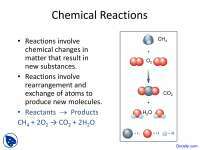 • The second row nonmetals require eight electrons to fill the 2s and 2p orbitals (octet rule). example: Cl2 • Neon has eight electrons, so it does not form bonds. 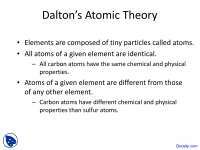 • Count the total number of valence electrons from all the atoms. hydrogen atoms have two electrons (one bond) and other atoms have eight electrons (combination of bonding and nonbonding). 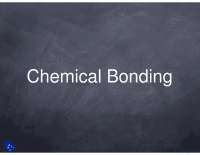 Nonbonding pairs of electrons are also know as lone pairs.